Mark Cuban may be rich, and may be smart when it comes to money and investing, but he sure is clueless when it comes to Russell Westbrook. 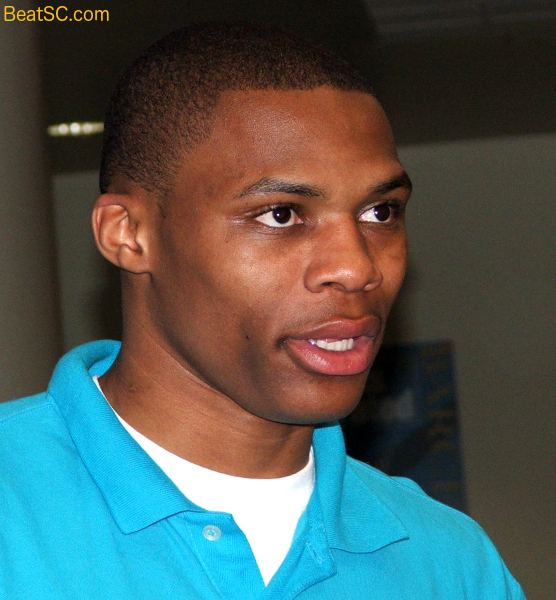 Recently, Cuban spouted off about the former Bruin Basketball star, saying that Russ was not a Superstar. Cuban has been eating those words all season long, but he should really be gagging on them today, after Westbrook last night set the ALL-TIME NBA RECORD for Triple-Doubles in a Season, with 42. This new mark breaks Oscar Robertson’s record, which had stood for a remarkable FIFTY-FIVE YEARS! As if setting that record isn’t enough to make Cuban choke on his own idiotic words, Westbrook didn’t stop wowing everyone upon achieving that goal; In fact, with his Thunder down by 10 late in the game against the Nuggets, Russell scored 15 consecutive points to end the game, including a THIRTY-SIX foot three-pointer AT THE BUZZER to give Oklahoma City a 106-105 victory. It wasn’t like Denver was lying down; This game was a must-win for the Nuggets. The loss eliminated them from the Playoffs. And they have Westbrook to NOT thank. Westbrook scored FIFTY-ONE points, had 16 rebounds, and 10 Assists in addition to winning the game at the final horn. Westbrook is a leading candidate for League MVP, and considering the fact that he is AVERAGING a Triple-Double for the Season, and leading the League in Scoring, it would be a travesty if they gave the award to anyone else. Russell is the first person to average a Triple-Double for a whole year since Robertson did it a half a century ago. No other player in history has accomplished this magnificent feat, not Michael Jordan, not LeBron James, not Wilt Chamberlain — not anyone but Russell and Oscar. Westbrook’s 51-point Triple-Double is his third Triple-Double this year with at least 50 points. No one else has done that three times, in their entire careers, let alone all in one season! Russell TWICE got 7 Triple-Doubles in a row. Those two runs are the second-longest T-D streaks, after Wilt’s 9, and Russell’s 79th career T-D last night pushed him past Wilt, to 4th all-time. The point is that he is unarguably a Superstar, and if he indeed wins the MVP, they should make Mark Cuban hand him the trophy. "WESTBROOK IN “BEST” BOOK" was published on April 10th, 2017 and is listed in Blue & Gold News, Non-Rivalry Photos, UCLA/usc/Sports Photos.